CAN YOU CHECK MY BLOOD PRESSURE, DOC? 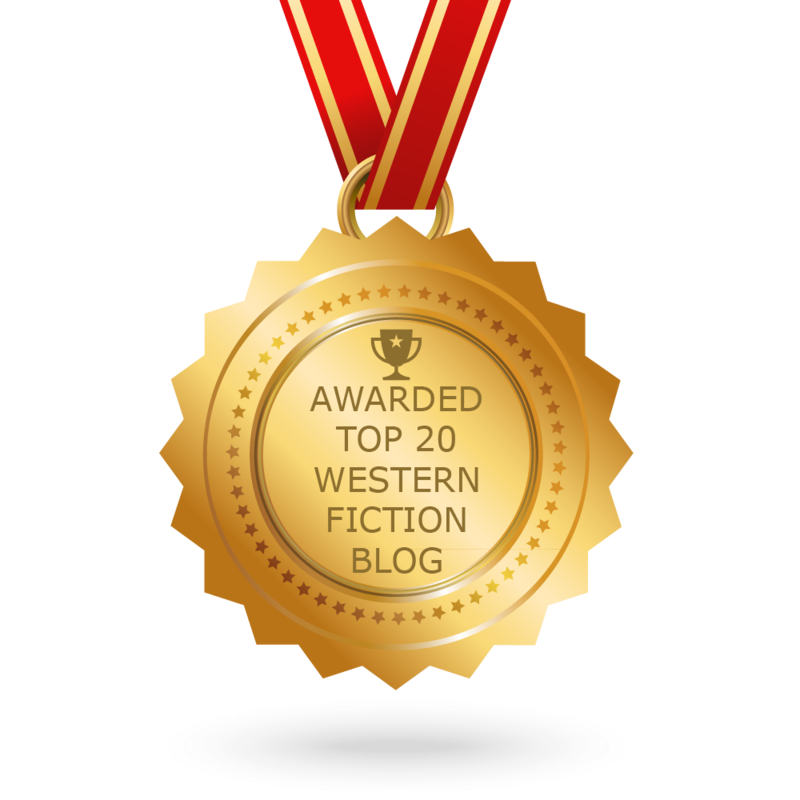 I'd planned to write my article on A Million Ways to Die in the West, but can't overwhelmingly endorse it. <snort> Okay, I did laugh out loud a few times, but if they'd taken the F-bomb out of the script, the movie would've been about 20 minutes long. Enough said about that. So it's back to my favorite stomping grounds, the archives of The Owyhee Avalanche. I didn't have to look far, and I'm not going write a whole lot today, because this report of a house fire really tickled my funny bone, and I hope you're entertained as well. Coppers are storytellers. Partly, I think, because so many stories happen to us on a daily basis—stories that, as I’ve said before, worm their way into our subconscious and shape who we are and how we view the world. 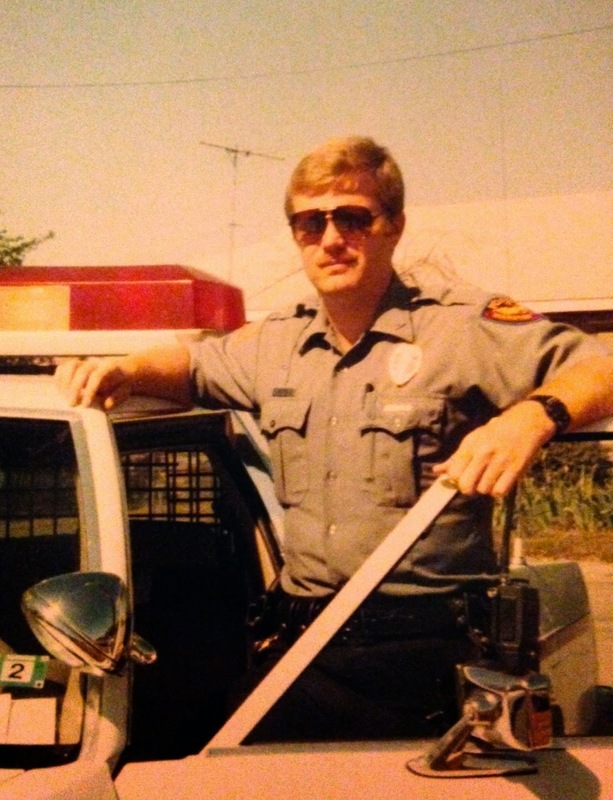 “Down these mean streets a man must go who is not himself mean…” The rest of the quote is pretty cool too, but seems a little self-serving since I spent thirty years on the job. 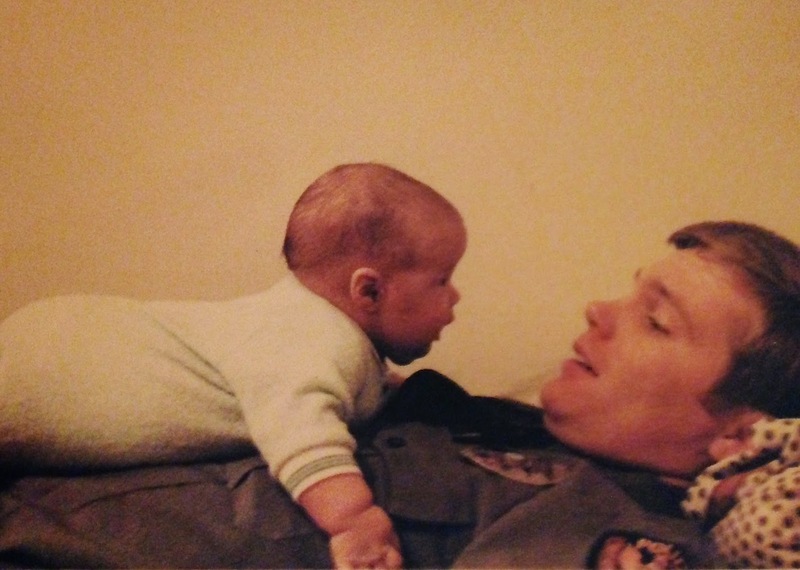 A mutual friend recently told my son that though he’d heard many of my war stories as he grew up, now that he was “on the job”, I’d likely tell some that that were new to him. That friend was absolutely correct. Some stories, you just don’t tell your eighth grader. I’d been dispatched to an apartment complex where the manager had noticed the windows to a certain apartment were covered with flies, lots of big, green-backed, nasty things, crowding inside the heavy drapes, leaving countless black specks and tiny trials of something more sinister on the glass. An incessant buzzing, enough to drive you crazy if you stood there very long, vibrated the air. It was mid summer and no one had seen the occupant for nearly two weeks. Sitting there at the church social over punch and cookies, and oblivious to the under-the-table nudging from my wife, I explained to the paling folks around me that my backup officer and I dabbed our mustaches with Mentholatum jelly in anticipation of the gruesome scene we knew we’d find inside… Finally, my wife put a boot to my ankle and I realized a couple of our friends were about to throw up. I toned down the rest of the story, minimizing the goriest details of what we found in that apartment, while noting the entranced reactions from several at the table. I knew I wanted to write and some people were keenly interested in this stuff. Writing about a violent conflict is of necessity different that the real deal. 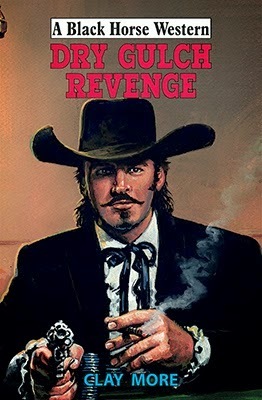 In a book or on film, fights, as I’ve noted before, are usually portrayed as contests of skill where opponents go toe to toe in a flurry of fists and feet, square off with knives, or even have a showdown at high noon. In reality, a person who wants to hurt you will rarely face you mano a mano. Extreme violence looks a lot more like an assassination than a fight—a brutal attack with overwhelming force. Think a brick to the head when you round a corner, a blade to the kidney that feels like a punch, or the bullet you never hear. There are, of course, fights. I’ve talked about the realities of a punch to the beak in past essays. When I was younger, I liked to box. I still enjoy a good scrap. But an honest to goodness fight—the kind into which I throw Jericho two or three times per book—those are a different story. Many years ago while en route to pick up a load of prisoners in Ardmore, Oklahoma, my partner wrecked a van during an ice storm on I-35. We rolled one-and-a-half times, coming to rest on the passenger side. Other than the box full of leg irons smacking me in the head, I don’t remember many details—only that it seemed to go on forever. There was an odd hissing noise coming from outside once we stopped. Both my partner and I thought we might be on fire and scrambled out like gophers through the driver’s side door, which, and that moment, was pointed toward the sky. Turns out, the noise was air leaking out of the tires. My partner, the senior deputy and former Texas Highway Patrol, nodded in approval as we stood on the side of the road—and told me he was proud I hadn’t wet myself and run off screaming. Interesting to find out where he set the bar on my behavior. I think of that wreck often when I’m teaching defensive tactics—or writing about a fight—because real human violence has a heck of a lot more in common with a car wreck than a boxing match. Law enforcement officers know this. They see it everyday. So, they try not to fight, but when they do, they certainly don’t fight fair. A good cop, one who is well trained and fit, will always bring a gun to a knife fight—or even a stick fight—because they aren’t there to go toe to toe. They’re there to take care of the situation—and win. Jericho knows this as well. When he fights, it will always be with the most overwhelming force he can muster. Of course, a good adventure requires the odds be stacked against the hero, so Jericho gets plenty of that as well. 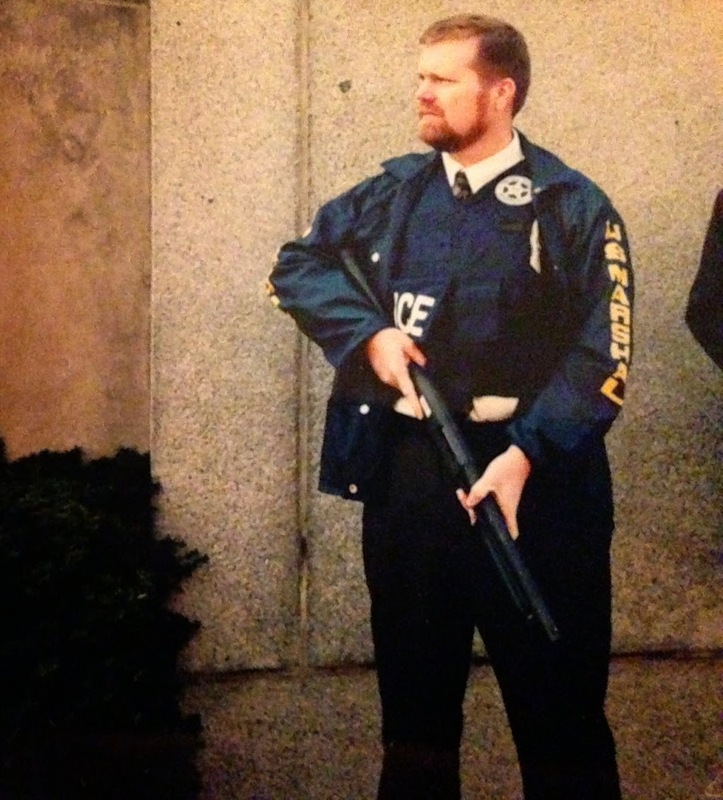 Well-meaning folks often ask if I’ve ever shot anyone, if I’ve ever been shot, or if my vest has ever saved me. Most of that is none of their business. But the fact is, my vest has saved me from serious injury on more than one occasion—once, during a knock-down-drag-out fight in a restaurant kitchen where I was kicked in the chest and knocked into the edge of a stainless steel table. I reimagined that scrap for a scene in DAY ZERO. In reality, I was off work and peeing blood for a couple of days—Jericho is built of stronger stuff. Hopefully, so is my son. 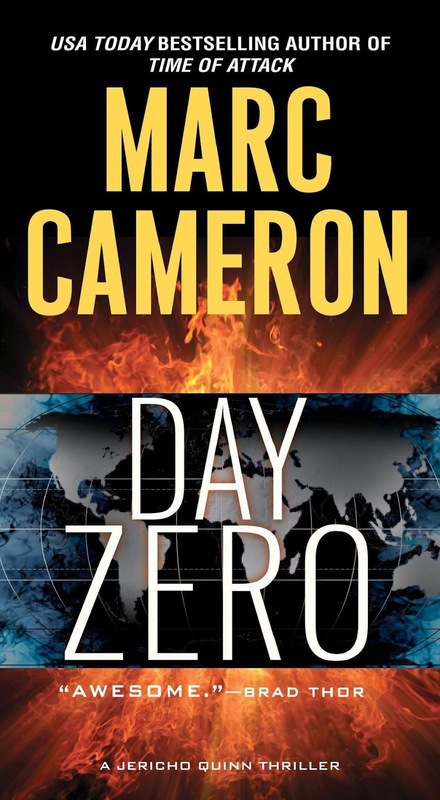 DAY ZERO, fifth in his USA Today Bestselling Jericho Quinn Thriller series, is available now. 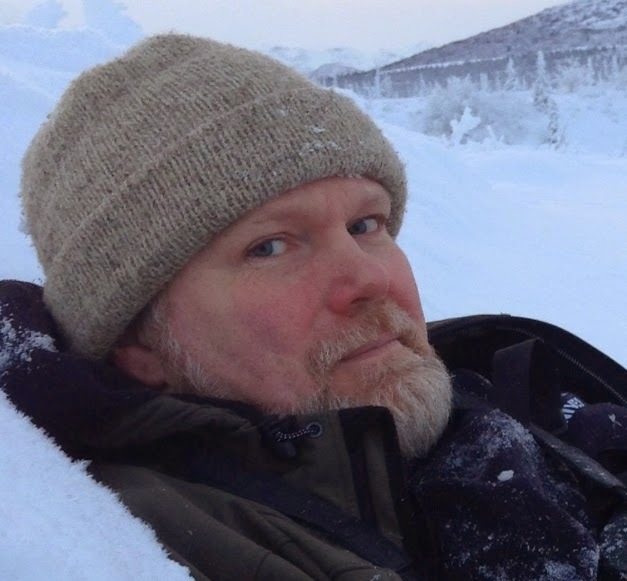 Marc lives in Alaska with his beautiful bride and BMW motorcycle. 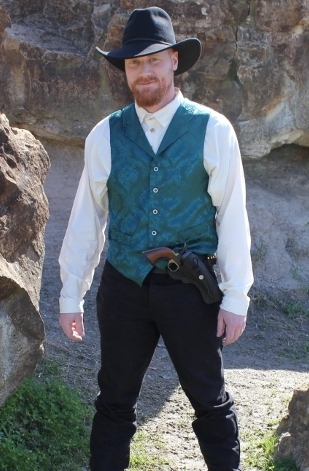 Perhaps the biggest embellishment that Western movies and television shows make in regards to historical fact is the gunfight because in reality, they were few and far between. But it did not begin with Hollywood. 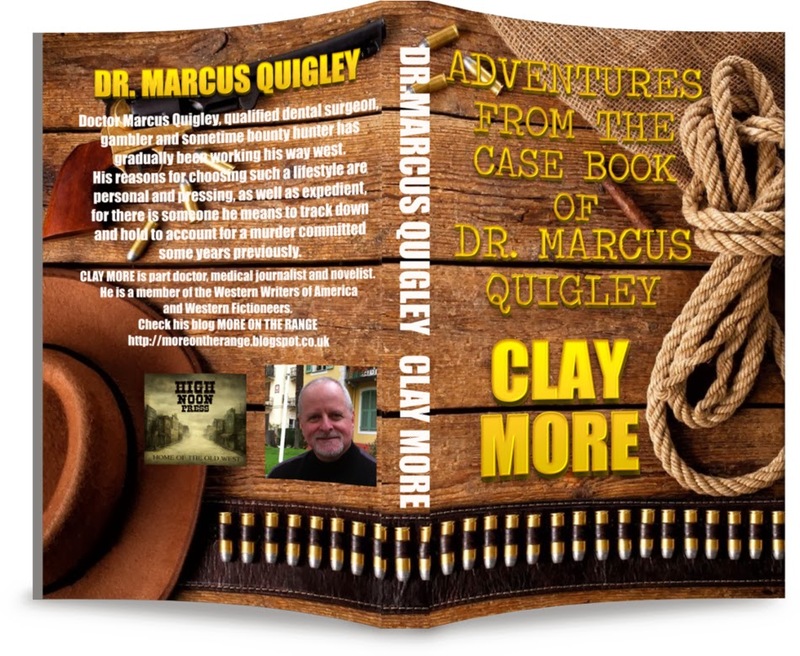 This kind of rewriting history first began with the dime novels of the era and even newspapers would enhance the few events that actually did occur. 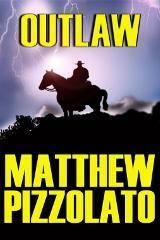 The gunfight at the OK Corral has been reenacted in countless movies over the years in many different ways. Historians still debate about what exactly took place that day and what actually happened will probably never be known. Regardless, a gunfight has pretty much come to define each Western movie and there have been a lot of them over the years. There's certainly quite a few to chose from and it's difficult to narrow it down, much less put them in any particular order. Among my favorites are the meadow scene in John Wayne's TRUE GRIT and I'm partial to JOSEY WALES, but I think that the scene at the end of OPEN RANGE has to be among the very best. 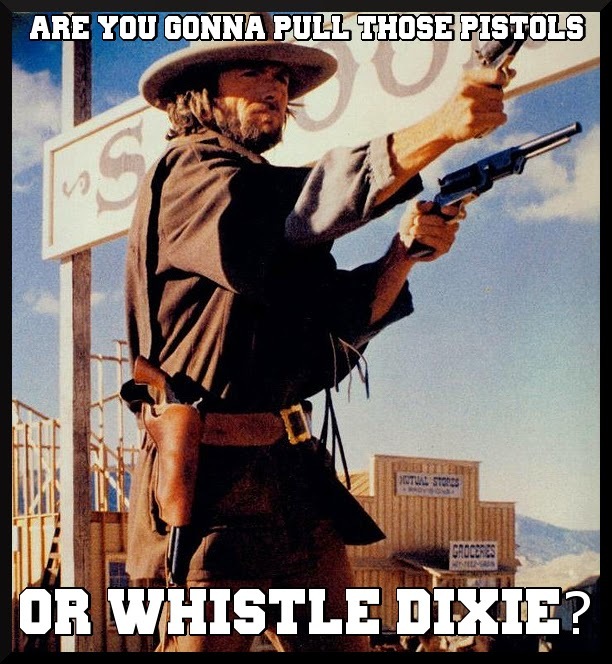 What do you consider the best Western movie gunfight? Blending in for 100+ years! History buffs were literally all “a-Twitter” recently over a news story released by Great Basin National Park officials. 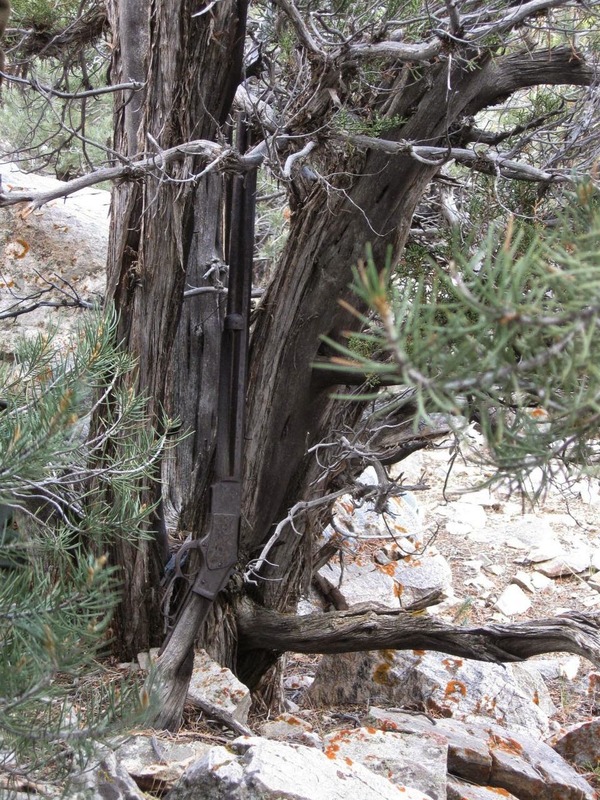 The incredible account of a rusty Winchester rifle found leaning against a juniper tree in remote northern Nevada has sparked the interest of researchers, gun experts and, yes, more than a few fiction writers. The Model 1873 rifle (.44-40 caliber, for those of you who like to know these things) very likely has been resting against that tree for over a hundred years. Oh, the stories we could conjure up! What I found interesting about the news release was its date: Great Basin’s Facebook page announced it on January 8, 2015, and it later became a national headline. But when was the gun actually found? Last November, staffers on an archaeology outing noticed it…perfectly camouflaged against the gnarled juniper trunk. Park officials did not rush to the local TV station or blast a social media “Eureka!” I’m sure there was a lot of jumping up and down with glee on their parts, but they took the time to do a little research before revealing the discovery. Remarkably, the serial number was still visible. Park staff members checked it against the Cody West Firearms Museum's records. They learned that it was manufactured and shipped in 1882, although Winchester records don’t indicate the purchaser or shipping destination. Great Basin continues to scour local newspapers and other historical records for more information about “the Gun Frozen in Time.” They are preserving the rifle from further deterioration and plan to display it at the park. My point is that the story is much more interesting with all of those additional details than it would have been back in November. Sometimes it pays to sit on a story. Last week, I was handed a challenging writing project with a very short turnaround…as in four days, start to sparkling finished product. In my opinion, it wasn’t quite sparkling or finished, althought the client seemed pleased. 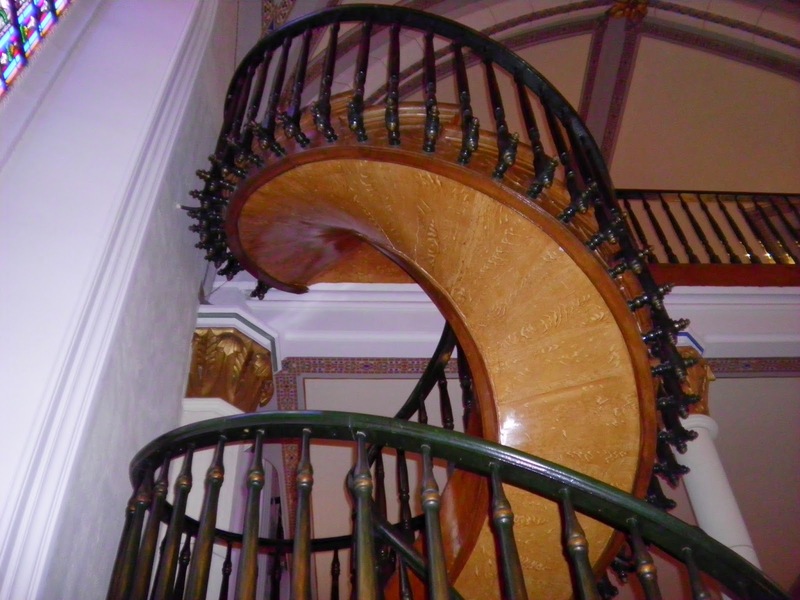 I have learned–both from experience and other writers–that stories need a little “steep” time. It’s natural to be excited about a finished book or short story and want to release it as soon as possible. 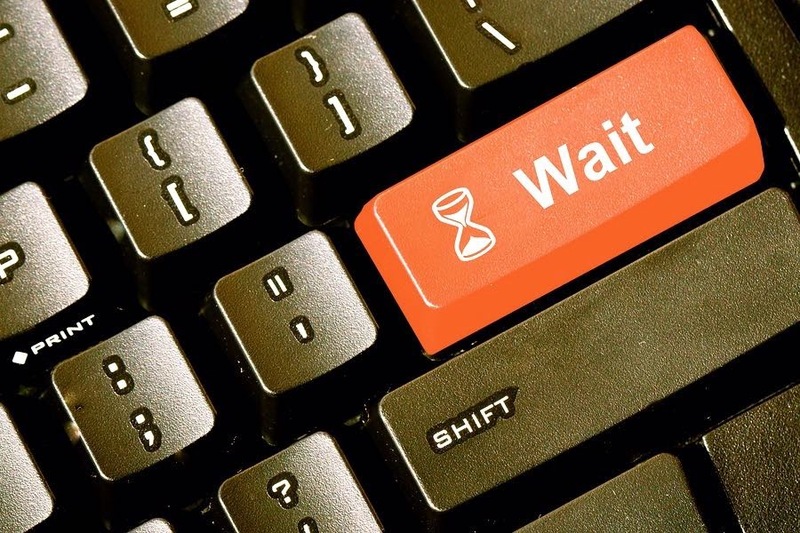 I’m learning that the sequence, for me, is write/edit/write/edit/WAIT. Wait a week, maybe two. Maybe longer, depending on the length and complexity of the project. I think about it while I go on about other things. Without fail, I discover some nuance or detail that improves the story. Ooh..what if they knew each other back in Kansas? What if they’re brothers? Wait, did I get those dates wrong? Hmmm, that section seemed long/short/boring/etc. Drop a tea bag in hot water. 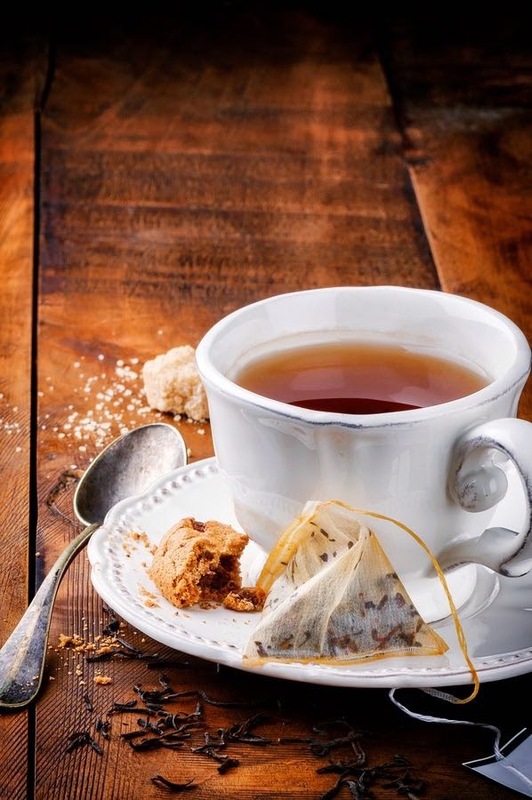 Just because it immediately looks like tea doesn’t mean it’s drinkable. A cake taken out of the oven has to rest before it can be cut and devoured. 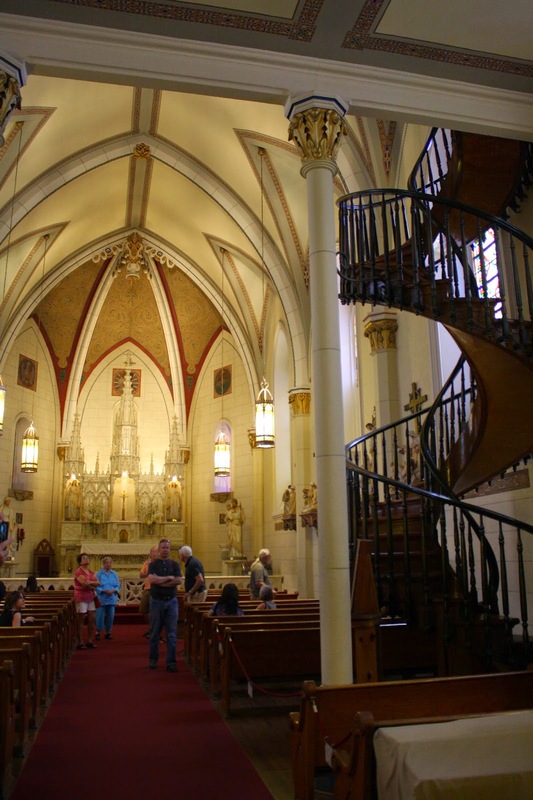 An old Winchester’s story comes to life as someone takes the time to track down its history. Let your work settle after it’s finished. When you go back to it, it will tell you where it needs help. Take time to listen. How is its construction possible? 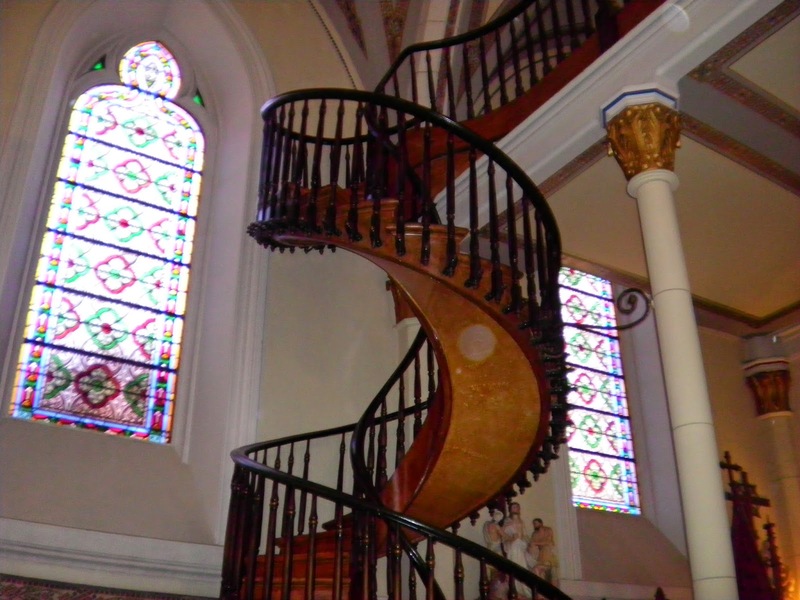 The Miraculous Staircase, as it is called, was built during a six-month period sometime between 1877 and 1881. 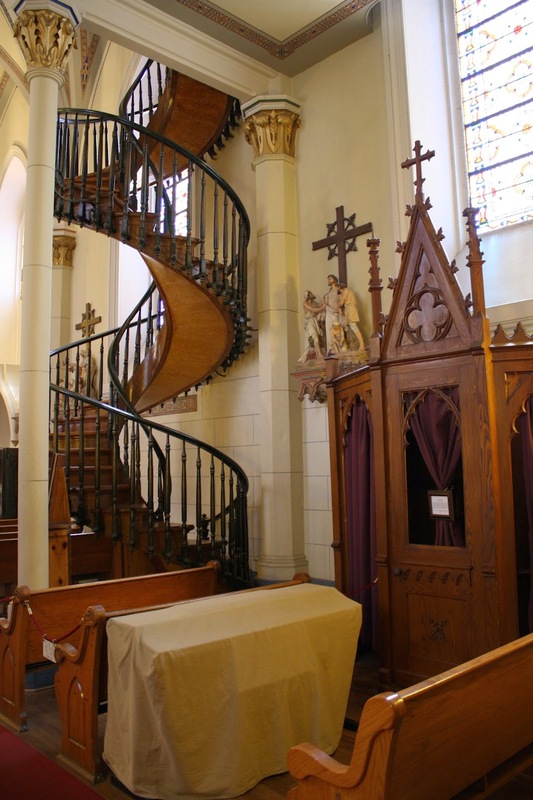 To understand the story of the staircase, we must understand a little about the chapel’s history; the vision of its founding; the courage and determination of the people dedicated to its success; and the unwavering faith of these pioneering spirits. 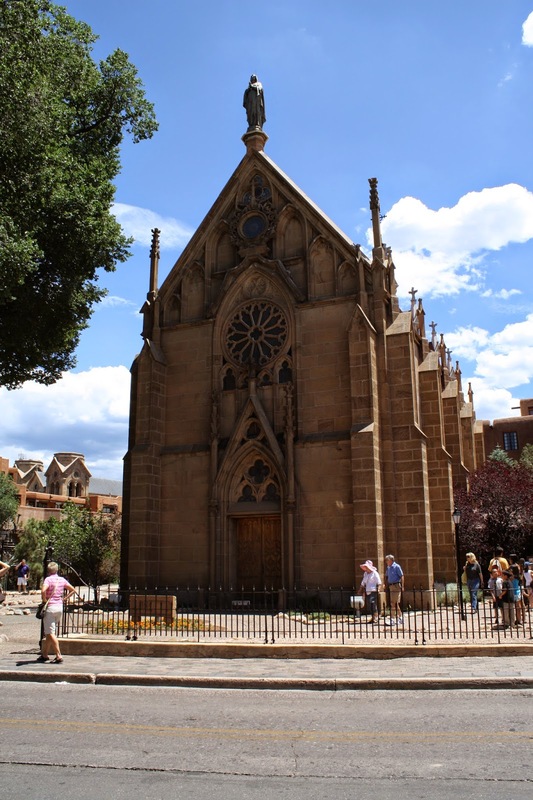 Loretto Chapel’s story begins in 1853 and ends in 1971 when it became a private museum for the primary reason of preserving the Miraculous Staircase and the chapel. 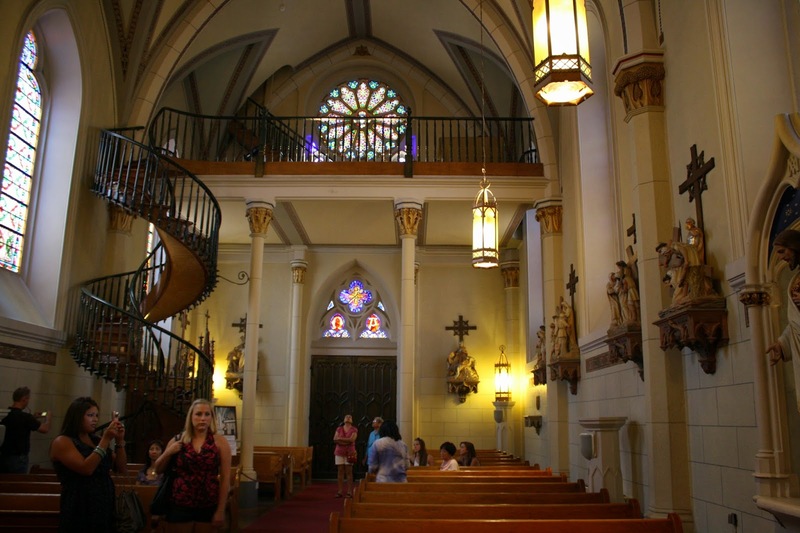 Sisters leave St. Louis and travel to Independence, Mo. 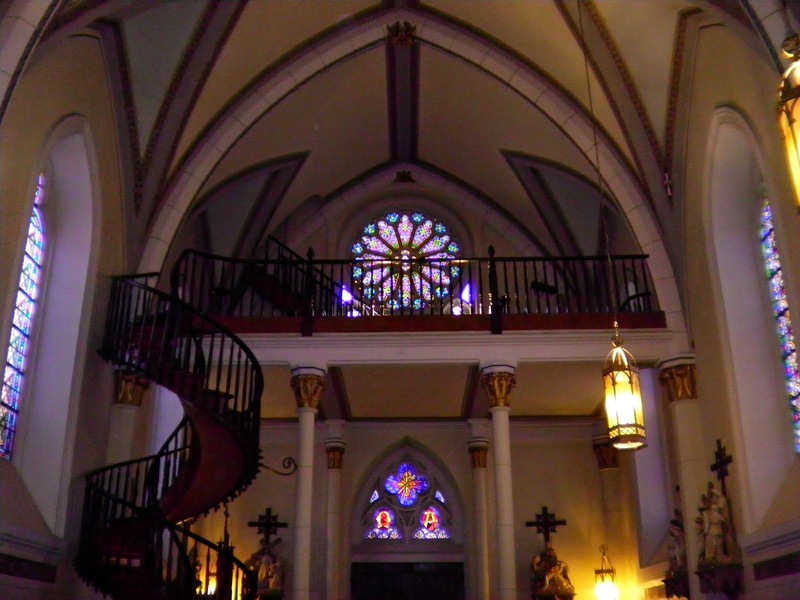 According to the history/legend on the Loretto Chapel website, the Miraculous Staircase is believed to have been constructed by St. Joseph, patron saint of carpenters, who answered the sisters' prayers for a solution to the access problem to the choir loft, when he arrived at the chapel with a donkey and a toolbox, and said he was looking for work. 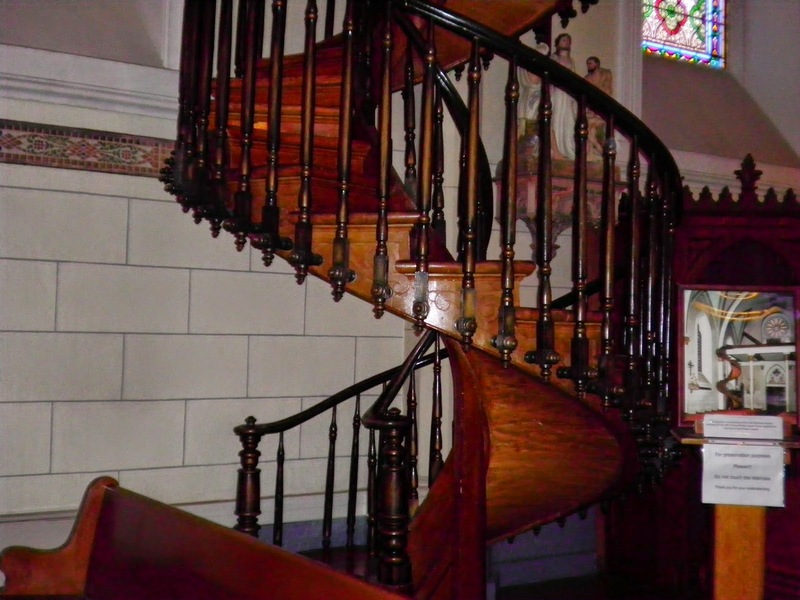 When he finished the staircase, he disappeared without payment or thanks. 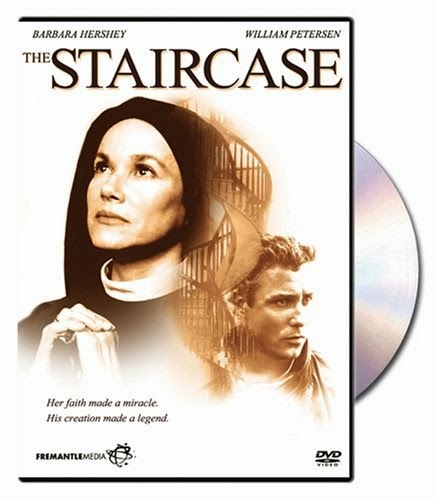 The 1998, made-for-television movie, The Staircase, stars Barbara Hershey as the mother superior and William Peterson as the mysterious carpenter. Yes, there's the Hollywood spin that fiddles with the *facts*; the story is a little slow, contrived, and melodramatic at times; but it’s still worth spending the 95 minutes to watch it, even if you only watch it once. Note: I took the pictures I used in this blog post. Please feel free to copy/download/use the images as you like. In 1972, when Robert Redford hit the screen in the popular western film Jeremiah Johnson, girls and women gushed over the rugged good looks and strong, often-silent actor tramping through the hard wilderness. He'd portrayed the Sundance Kid opposite Paul Newman's Butch Cassidy in that huge hit three years earlier, and also the sheriff in Tell Them Willie Boy Is Here. 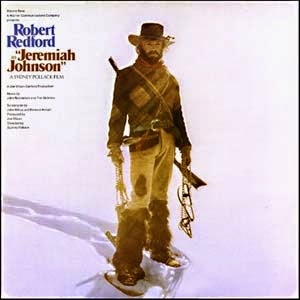 Redford looked great on horseback, tramping through the snow, appreciating unspoiled nature. 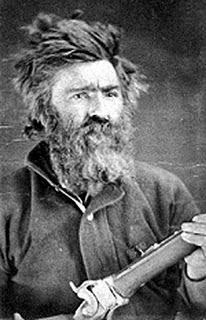 But few knew the real story behind the mountain man John "Liver Eating" Johnson. First, the film took its sources from Raymond Thorp and Richard Bunker's book Crow Killer: The Saga of Liver-Eating Johnson (1958) along with Vardis Fisher's Mountain Man (1965). Both novels are still in print today. Johnson was a legend, indeed, since few original sources mention him. There were multiple men named Johnson who lived in the west in that era, but he was distinguished by his nickname. Supposedly, the mountain man was born in New Jersey with the surname Garrison and served on a naval ship in the Mexican-American War. He deserted after striking an officer. That's when he changed his name to John Johnson and headed to Alder Gulch, Montana Territory, to dig for gold. He may have cut wood and stacked them into cords for steamboats. He stood six foot or six foot two, around 260 pounds without a bit of body fat from all the hard work he did as a sailor, gold miner, wood-hawk, hunter, trapper, scout, soldier, whiskey-peddler, log cabin builder, deputy, guide, constable -- whatever he could do to earn money. But the real legend of becoming "Liver Eating Johnson" and "Dapiek Absaroka" or Crow Killer began around 1847. Johnson had taken an Indian wife from the Flathead tribe, who was murdered by a band of Crow Indians. Johnson didn't take kindly to that, and hunted them down - cutting out and eating their livers after death. Crow Indians believed the liver was a vital organ on their path to the afterlife, so that was a true insult. The film, however, never mentions that in dialogue. Several tales of Liver Eating Johnson - that of being attacked by a band of Blackfeet who planned to sell him to the Crow, escaping and surviving by eating the legs of a captor, may be attributed to another and far more notorious mountain man of that era, killer and cannibal Boone Helm. Other famous mountain men include Kit Carson, Jim Bridger, Old Bill Williams, James Clyman, John Colter, David Edward Jackson, Jedediah S. Smith, Doc Newell and Jonathan Warner. 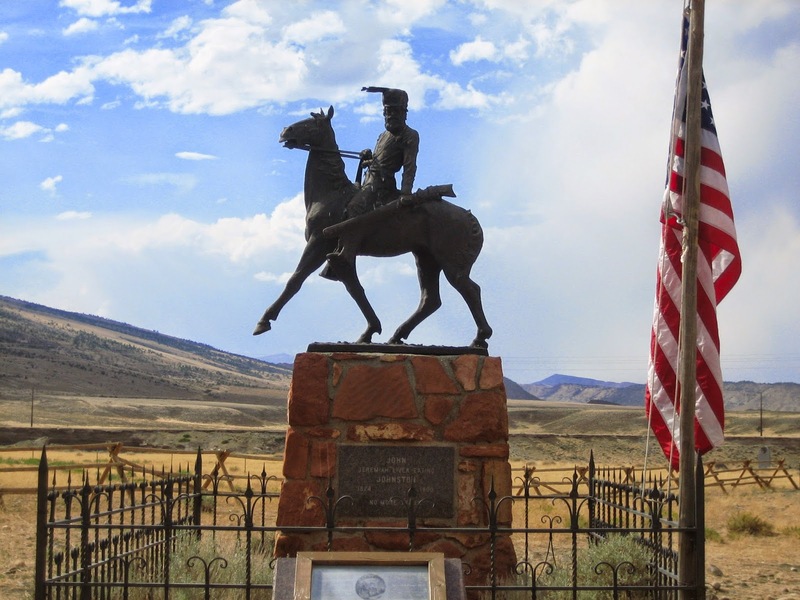 Despite his former desertion under a different name, Johnson enlisted in the Union Army in 1864, Company H, 2nd Colorado Cavalry, and received an honorable discharge in 1865. 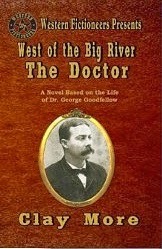 He returned to Montana, preferring solitude, but did serve as deputy sheriff in Coulson and as town marshal in Red Lodge in the 1880s. By the end of his life, however, he spent his last month in a veterans home in Santa Monica, California. Johnson's body was relocated to Cody, Wyoming, from a Los Angeles cemetery after a 5th grade class and the teacher campaigned for it. The bronze statue below stands above Liver Eating Johnson's grave at Old Trail Town. The Avenging Fury of the Plains: John Liver Eating Johnston. Dennis J. McLelland, Infinity Publishing, 2008. Tales of the Mountain Man. Lamar Underwood, Editor, Lyons Press, 2004. Jim Bridger, Mountain Man. Stanley Vestal, University of Nebraska Press, 1970. 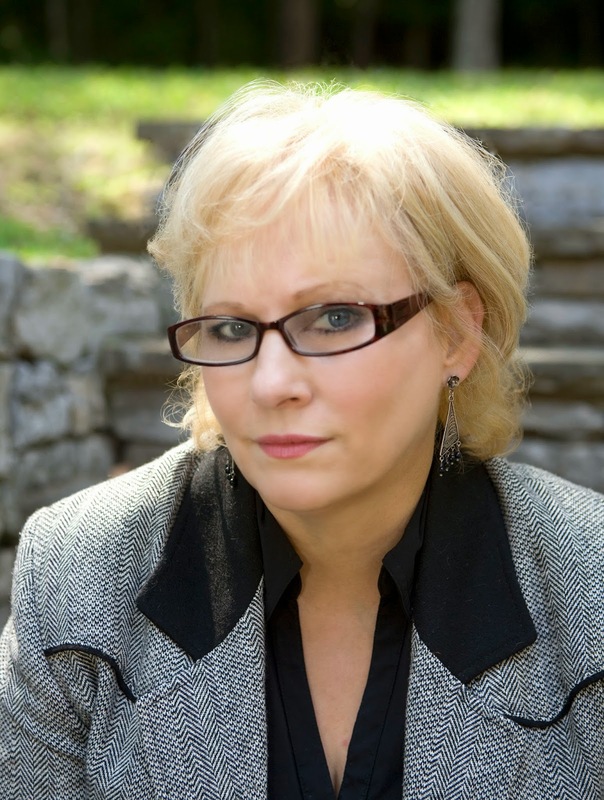 Mystery author Meg Mims lives in Southeastern Michigan with her husband and a 'Make My Day' Malti-poo dog. 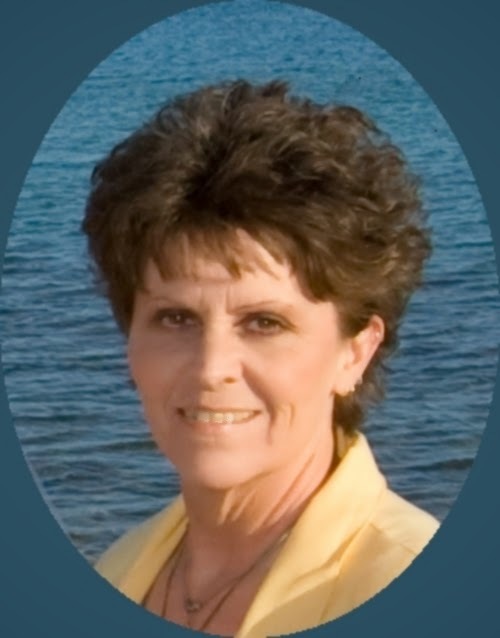 Meg loves writing novels, short novellas and short stories, both contemporary and historical. Her Spur and Laramie Award winning books - Double Crossing and Double or Nothing - are now among the Prairie Rose Publications book list. Meg is also one-half of the D.E. Ireland team writing the Eliza Doolittle & Henry Higgins Mystery series for St. Martin's Minotaur. Wouldn't It Be Deadly, Book 1, is out now! Book 2, Move Your Blooming Corpse, will be out in 2015. You can find Meg (and D.E. Ireland) on Twitter, Facebook and Pinterest. We all try hard to have our stories ooze with authenticity. If a reader spots an anachronism in your tale the chances are high that he or she probably won't read much further. If you have a town doctor in the old west glibly reach for a blood pressure machine and take a patients blood pressure then you are in anachronism-ville! 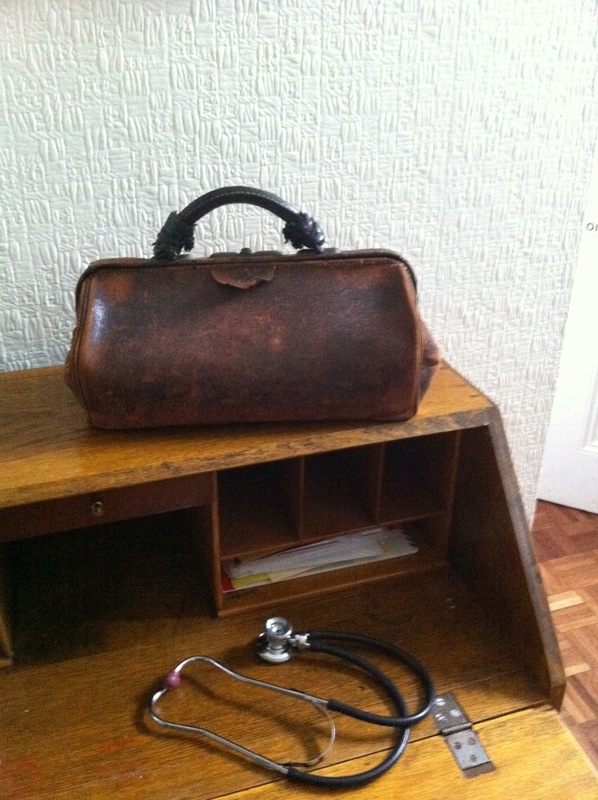 Back then there was no such instrument in the doctor's bag. They had no awareness about th importance of blood pressure. Nowadays, the taking of a person’s blood pressure is regarded as one of the basic parts of a physical examination. 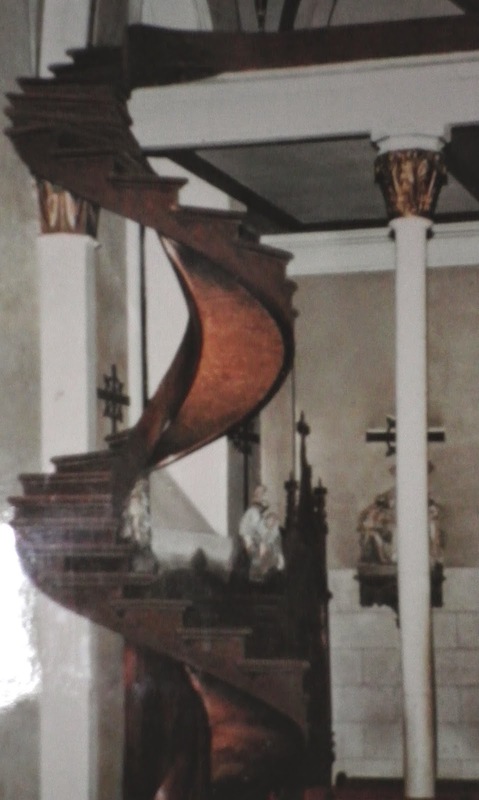 It is interesting that the first experiments upon it were done not by a medical practitioner, but by a Church of England priest, the Reverend Stephen Hales in the eighteenth century. 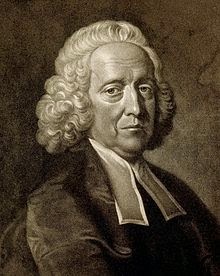 The Reverend Stephen Hales (1677-1761) was intensely interested in science and he had ample time to pursue his interest. He made contributions to botany, chemistry and medicine Among other ingenious inventions he invented a a set of forceps for surgeons to use for the removal of gall stones. He conducted twenty-five experiments on several dogs, three horses, a sheep and a doe. He published his findings in the Statical Essays in 1733. He deduced that the maximum pressure of the blood was reached at the end of a cardiac contraction. He further deduced that it would give an idea about cardiac output. He also deduced that the lowest pressure would be a measure of the resistance to flow and that it would be during the relaxation of the heart. These were really extremely important findings, but it was not until a century later that any practical means of measuring the blood pressure could be developed. 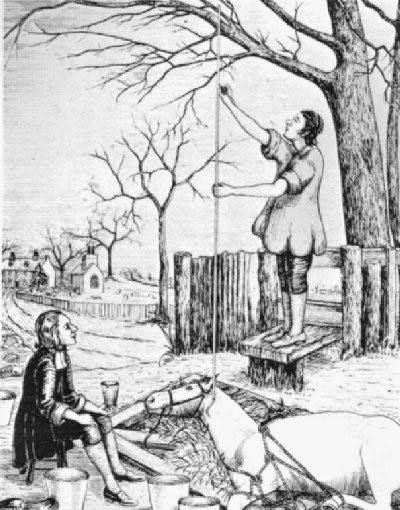 Even then the methods of measuring were invasive, involving canulating arteries, so they were of no use in clinical medicine. It then took another fifty years before a non-invasive and practical method was devised. 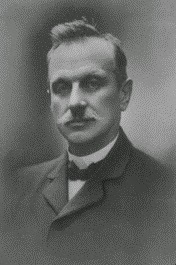 In 1896 Scipione Riva-Rocci invented the sphygmomanometer. 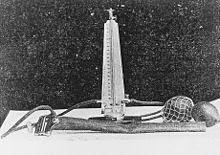 This was done using an inkwell, copper piping, a bicycling wheel inner tube to form a mercury manometer. It was subsequently refined by Von Recklinghausen in 1906, which used a moving needle to measure the pressure. In neither of these was a stethoscope used. Indeed, the stethoscope was still a relatively new instrument and it did not occur to anyone that there were useful sounds that could tell one about blood pressure. 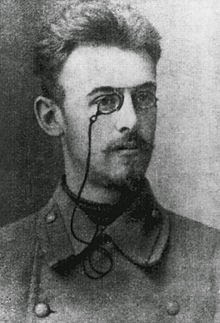 A Russian doctor, Nicolai Korotkoff (1874-1920) wrote a thesis about his use of the stethoscope to measure blood pressure in 1910. It was entitled Experiments for determining the strength of the arterial collaterals. 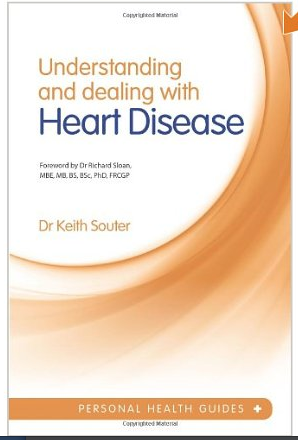 In this book he outlined the method of taking the blood pressure that has been used right up until the present day. This involved applying a cuff attached to the sphygmomanometer and listening with a stethoscope over the brachial elbow at the elbow. The cuff is inflated until the radial pulse is no longer felt. The reason for doing this is to collapse the vessel, by making the pressure in the cuff greater than in the blood vessel. Then the cuff is slowly deflated. A series of different sounds will be heard. The first one is the noise of blood flowing. It is the maximum blood pressure. Then other sounds are heard, having a significance in relation to the cardiac cycle, although we need not go into the technicalities in detail here. The important sound was when the sounds disappeared, which represents the minimum blood pressure. Nowadays electronic sphygomomanometers are used, since they are extremely accurate at detecting blood flow. They have by and large replaced the traditional method of listening with a stethoscope, although a lot of doctors still trust to their ears and the traditional method of listening to the Korotkoff sounds. It sensible for adults to have their blood pressure checked at least every five years until the age of eighty. It should be done annually after that. If it is found to be borderline at any stage then your doctor will want to monitor it more frequently. If it is persistently raised then there are excellent treatments that will reduce the risk of the conditions mentioned above.